Lauren Baumberger of McIntosh has been named second team to the Class B Girls All-State Basketball Team. The six-foot senior capped a strong high school career with some astounding numbers this year. 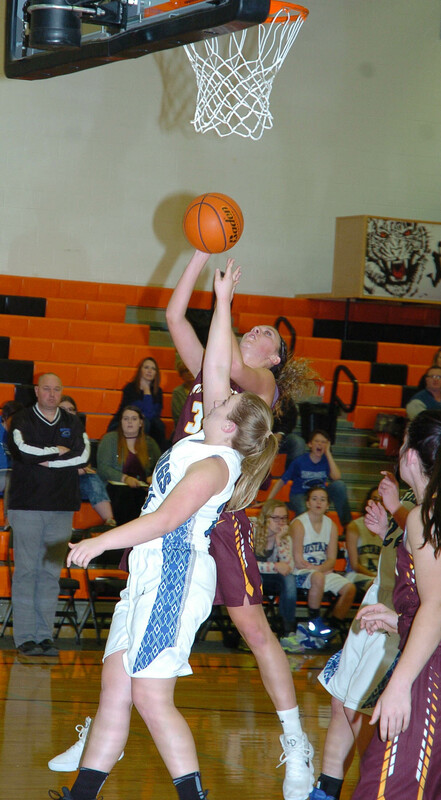 She averaged 23.5 points, 11.8 rebounds, 5.2 blocked shots, 4.5 steals and 4.2 assists per game for the Tigers. Her 466 points this season gave her 1,766 for her career. Baumberger will take her game to the next level as she continues her career at Black Hills State University. Karly Gustafson, 6’0, Sr., forward, Ethan; Kamryn Heinz, 5-9, Sr., guard, Ipswich; Mattilynn Reiner, 5-9, Sr., guard, Tripp-Delmont/Armour; Laurie Rogers, 6’1, Sr., center, Warner; Lauren Sees, 5’8, Sr., guard, Avon; Caelyn Valandra-Prue, 5’9, Soph., guard, White River. Lauren Baumberger, 6-0, Sr., guard/forward, McIntosh; Alayna Benike, 5’11, Soph., forward, Castlewood; Avery Broughton, 5’10, 8th, guard/forward, Corsica-Stickney; Morgan Edeleman, 5’6, Soph., guard, Menno; Jaedyn Finkbeiner, 6-0, Sr., guard/forward, New Underwood; Janae Kolden, 5’9, Sr., guard, Clark/Willow Lake. Hilary Albrecht, 5’9, Jr., guard, Howard; Abigail Arend, 5’6, Sr., guard, Bridgewater-Emery; Lavin Bendt, 5’10, Jr., guard/forward, Kadoka Area; Halle Heinz, 5’5, Soph., guard, Ipswich; Ali Kranz, 5’11, Sr., guard/forward, Waverly-South Shore; Rynn Osthus, 5’9, Sr., guard, De Smet.